Throughout the nineteenth century, Newfoundland and Labrador’s economy centred on its ability to export goods to foreign buyers. More than anything else, it depended on the sale of locally produced salt cod to southern Europe, Brazil, and the West Indies. Seal products gained in importance during the early decades of the 1800s, but rapidly declined after 1870 when the stocks became depleted. The mining industry also expanded near the end of the 1800s and the colony began exporting copper, iron ore, and other minerals. The impacts of these developments on overall trade, however, were insignificant when compared to the saltfish industry, which accounted for 70 per cent of the colony’s exports by the end of the century. Newfoundland and Labrador fishers produced a variety of grades of saltfish which could be sold in a wide range of markets in the 1800s. The island’s inshore fishers produced the highest quality cure because they fished near their homes and could dry the cod almost immediately after catching it. 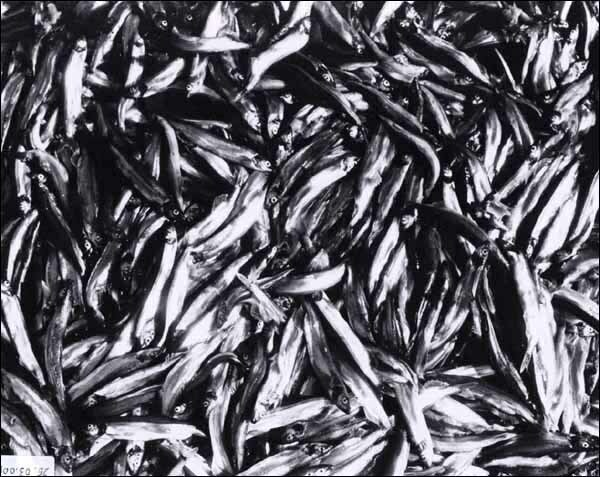 This light-salted hard-dried product was known as shore fish and often fetched the highest prices at the marketplace. There were, however, varying grades within this category, depending on the product’s size, appearance, moisture, and overall quality. Merchants hired cullers to rate a fisher’s catch and determine how much it was worth. Codfish in a Punt, n.d. The cod fishery was a mainstay of Newfoundland and Labrador's economy throughout the 19th century. Photographer unknown. Reproduced by permission of Archives and Special Collections (Coll. 137 24.02.028), Queen Elizabeth II Library, Memorial University of Newfoundland, St. John's, NL. The highest grade, known as merchantable, was a thick, yellow or golden fish that was light-salted and not too dry. This product fell into two categories: merchantable prime, which was of the highest quality, and merchantable number two. The second-best class of fish, known as Madeira, was thinner than merchantable and of a lesser quality. This was followed by West India, the lowest commercial grade of saltfish. However, if a buyer strongly disagreed with a fish’s classification, he or she could insist on changing the grade before purchasing the product. A merchantable rating, therefore, could sometimes be downgraded to Madeira. 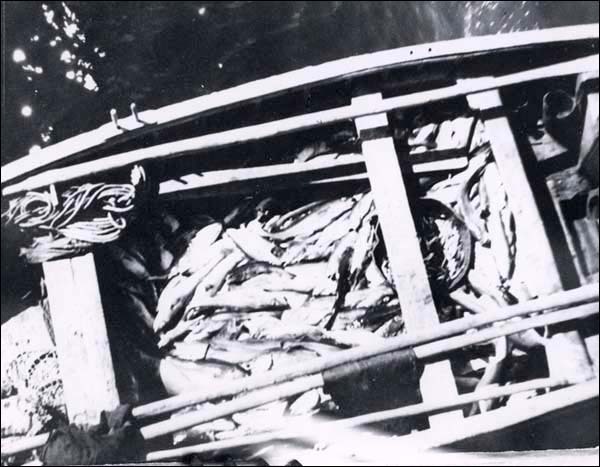 Fishers who migrated to Labrador each year to harvest cod there produced another grade of fish known as Labrador cure. This product was moister, more heavily salted, and generally inferior to shore fish, largely because of Labrador’s damp weather and the longer handling time needed to ship fish back to the island. Cullers divided this cure into two classes depending on quality: Labrador No. 1 and Labrador No. 2. Bank fishers also produced cures of varying quality, which cullers classified as either Labrador or shore fish. Once the fishers had caught and cured the cod, it was up to the colony’s merchants to sell the product to foreign buyers. Most accomplished this by hiring agents to work directly out of the various markets in southern Europe, Brazil, and the West Indies. Once a shipment of fish arrived, these men and women arranged to sell or trade it to an interested buyer. Sometimes the saltfish was exchanged for money and sometimes for goods which could not be produced in Newfoundland and Labrador, such as molasses or coffee. The major markets for Newfoundland and Labrador saltfish existed in Brazil, the West Indies and in the southern European countries of Spain, Portugal, Italy, and to a lesser degree, Greece. All of these areas had a warm climate, which made access to a well-preserved yet affordable source of protein essential. Saltfish was suitable on both fronts. Moreover, none of these regions possessed large fishing grounds of their own, but many could trade locally-produced goods for cod. The European countries produced salt, fruit, nuts, wine, and other goods, Brazil offered cotton and coffee, while the West Indies exported sugar, molasses, and rum to Newfoundland and Labrador for cod. The colony was able to attract such a wide range of markets because it produced so many different grades of the same product. Merchantable fish sold well in Europe, while Brazil bought Madeira cod, and the West Indies preferred the lowest and most inexpensive grade of saltfish. Spain, northern Italy, and Greece also accepted Labrador No. 1 and No. 2. Although saltfish accounted for the vast majority of Newfoundland and Labrador’s export trade during the nineteenth century, the industry did not expand during the time period and export levels remained largely the same. This is not the case with the seal fishery, which grew rapidly during the early decades of the 1800s before contracting in later years. Men Sorting Seal Pelts, n.d. The colony exported most of its seal products to Great Britain, where there was much demand for seal oil and leather. Photographer: Holloway. Reproduced by permission of Archives and Special Collections (Coll. 137 03.02.001), Queen Elizabeth II Library, Memorial University of Newfoundland, St. John's, NL. The colony exported most of its seal products to Great Britain, where there was much demand for seal oil and leather. Advances in lighting near the start of the nineteenth century placed seal oil in particular demand and directly impacted the industry’s growth. The fuel could be used to light homes, wharfs, street lights, and even lighthouses. The product was also useful in the currying, or finishing, of leather, in soap manufacturing, and as a lubricant. Seal leather also grew in popularity in Great Britain, where it was used to make upholstery, gloves, boots, jackets, hats, and other items. The importance of seal products dropped off in the latter half of the 1800s, when both the advent of gas lighting and the rising popularity of petroleum as a lighting fuel decreased the demand for seal oil. The industry fell into further decline after 1870 when seal stocks showed signs of depletion due to overexploitation. By the close of the century, seal products accounted for only about seven per cent of Newfoundland and Labrador’s export trade, a dramatic drop from the 30 to 40 per cent during the first half of the century. Alongside cod and seal products, the sea provided Newfoundland and Labrador with a variety of other, but much less significant, exports. These included salmon, lobster, herring, capelin, and squid, many of which found markets in France, Canada, the United States, and Great Britain. 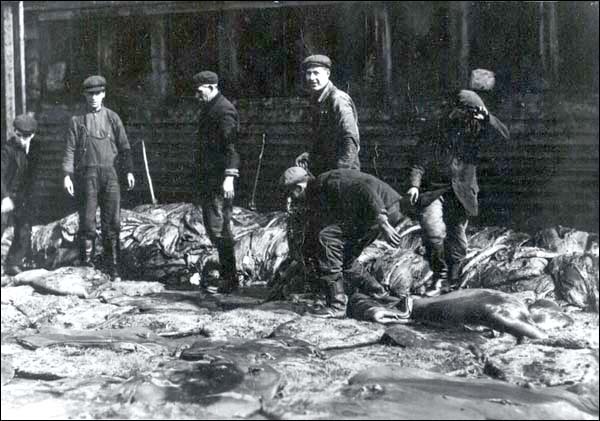 Although profitable (herring exports, for example, fetched almost $200,000 annually during the 1890s), the impacts of these products on Newfoundland and Labrador’s export trade were negligible when compared to saltfish. Alongside cod and seal, Newfoundland and Labrador exported other less significant ocean products, including salmon, lobster, herring, capelin, and squid. Photographer unknown. Reproduced by permission of Archives and Special Collections (Coll. 137 25.03.001), Queen Elizabeth II Library, Memorial University of Newfoundland, St. John's, NL. The mining industry also grew in importance near the end of the nineteenth century. A copper mine opened at Tilt Cove in 1864 and remained productive well into the twentieth century. Its exports peaked in value at $1,264,000 in 1877. An iron ore mine began operating at Bell Island in 1895 and proved even more prosperous than the Tilt Cove copper mine. By 1900, Bell Island iron ore accounted for about nine per cent of the colony’s exports, with much of the product being sent to Nova Scotia. Lumber exports also grew in importance during the late nineteenth century, but did not earn nearly as much as the colony’s fish and mineral exports. Newfoundland and Labrador possessed a weak agricultural base, which yielded only a small variety of goods for local markets throughout the nineteenth century. As a result, colony residents relied heavily on the importation of food and other consumer products from foreign countries. In the 1600s, many of these goods arrived from the United Kingdom and included such items as salt beef and pork, peas, hard bread, beer, fishing gear, cooking equipment, candles, and to a lesser extent, cheese, butter, vinegar, liquor, and other luxuries. As the colony developed in the coming centuries it began to trade with other countries. By the end of the 1800s it was importing goods from Canada, New England, southern Europe, Brazil, and the West Indies as well as from Britain. The bulk of these imports consisted of food items, with many agricultural imports arriving from New England. Other imports included furniture, books, feather bedding, glassware, medicines, and other merchandise. The colony sometimes paid cash for these imports, but at other times traded saltfish or other goods. Newfoundland and Labrador’s heavy dependence on international trade, however, made its economy vulnerable to external factors over which it had no control. If the demand for cod declined or if the price of imports increased, then the colony’s finances would suffer accordingly. Recognizing this danger, the Responsible Government made attempts to diversify Newfoundland and Labrador’s economy into the mining, agriculture, and forestry sectors during the late nineteenth and early twentieth centuries. Article by Jenny Higgins. ©2007, Newfoundland and Labrador Heritage Web Site.